Hotel Palomar is unusual in more ways than one. A boutique hotel that combines arty decor with a chef-driven restaurant, this place only has its entrance lobby at street level -- everything else is five floors above. Ensconced in a discreet corner of this hotel is The Fifth Floor: an elegant restaurant adorned in rich fabrics and dark wood, that comes alive during the evening hours. I had visited this place a few months back. 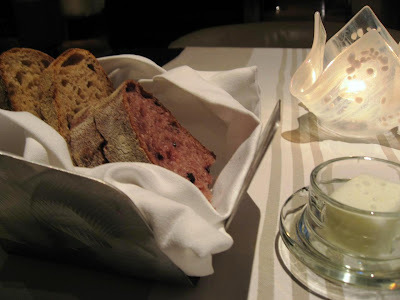 This time I decided to try Chef Jennie Lorenzo's tasting menu but without the wine pairings. Unlike Cortez, all items on the tasting menu are available on their regular menu as well. My waiter quickly served two different types of bread and a slab of butter. From my last experience and this one, I can say Fifth Floor serves some of the best bread in town. The one made with red wine was particularly interesting. 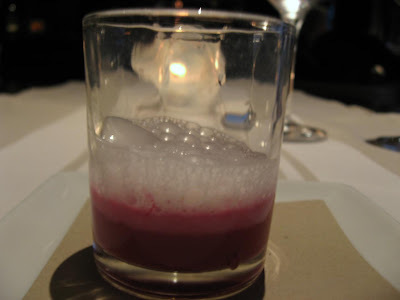 The amuse was a shot glass of chilled beet, milk froth and a few other ingredients, but the end result was unremarkable. I continued to nibble on the excellent bread and my fruity Pinot Noir waiting for something more exciting. The Tuna "Zuke" starter was nice! 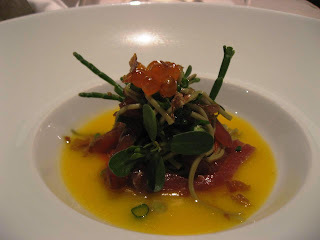 Sashimi strips with green tea soba noodles, yuzu vinaigrette and greens. 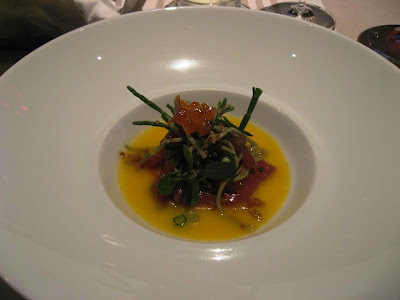 The burst of 'fishiness' from the salmon caviar mixed with the tangy soya flavor enhancing the taste of the tuna. The crisp greens added another layer of taste and texture that was both unique and satisfying. It took a while for the next course to make it to my table. 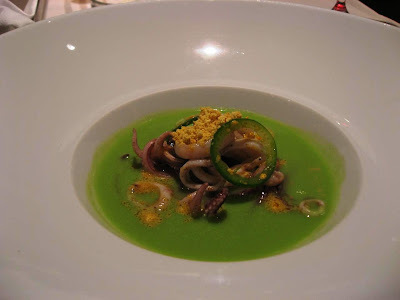 The English Pea Soup was served in a soup plate and garnished with spiced oil powder and calamari - a la plancha, i.e, grilled on a metal plate. The warm soup had a nice gingery-spicy taste that I liked. Next came my first entree, the Tea-Smoked Duck Breast with maitake mushrooms, glass noodles and blueberry infused dark sauce. This was the second dish today that was clearly inspired by Japanese elements. Did I mention Chef Jennie once worked for Ame, run by Japanese chef Hiro Sone and his wife? As for the duck: aha, this was excellent stuff! We were hitting the sweet spot now. 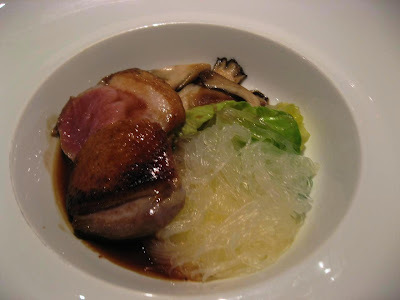 The duck had been expertly marinated, and the contrast between the crispy skin and the flesh was wonderful. The slight tanginess of the noodles was a nice touch too. 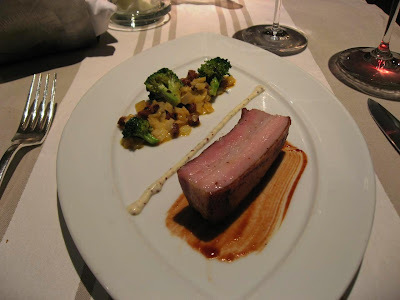 The second entree was the Slow Roasted Pork Belly with a potato 'risotto', chorizo and broccoli florets. The dish looked large and I wondered if I could finish the whole thing. But once I got started, there was no looking back. This was a winner too and the taste of the spices came through the potato-based risotto very nicely. 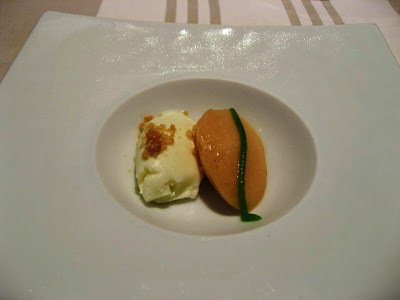 They offered an intermezzo of yogurt sorbet with peach that felt intensely cold, buttery and fresh -- all at the same time. 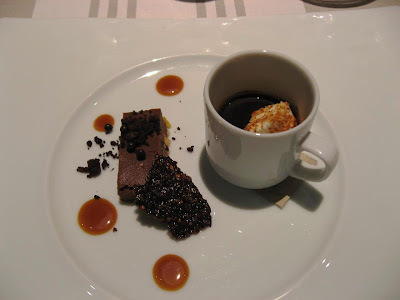 Then came the dessert of chocolate goodies with a cup of chocolate 'soup'. Nice. Very nice! 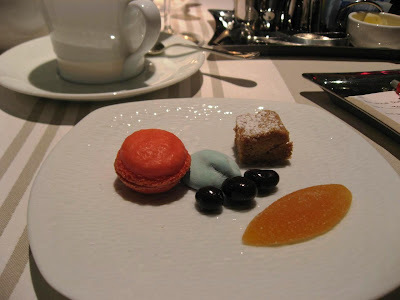 As I waited for my cheque, they followed their tradition of bringing a small platter of freshly made sweets: a mini macaroon and a other French goodies. This trip made a better impression on me that my previous one. Fifth Floor is a hidden gem tucked away from view, and a great choice for inventive, fresh creations in classy settings. 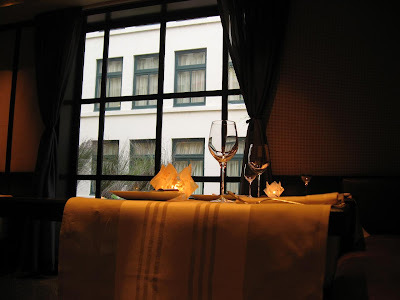 Fifth Floor is also among the few to be awarded a Michelin star in this city. Divine pictures and engaging write up. Sounds like quite the experience. I am just dying to travel around the US after reading your vast foodie experiences all over the States. It has to be my next big trip for sure. As for me, yes I am doing a one year cooking school course (Cert III) in Adelaide that involves 6 months 5 days a week 10.30 - 6.30 classes and 6 months of apprecnticeship industry placements. Thought it would be an interesting course and truly is something I have been wanting to do for some time now, as well as the incredible weightage I hope it will have on my resume. Hopefully it will set me apart from other wannabe food writers... finger crossed! Those really look good! Although I still prefer the portions to be bigger... Western full courses always seem so small to me, lol. What delicious servings and you always present it the most delicate way and spice it up with your personal experience and opinion - very interesting and readable! Btw: Sorry I haven't been around that much lately - have been touring France. The fish starter would have been my favorite. I find the green dish a bit...weird! @Meg: That's wonderful. Good luck! @kyh: American full courses seem smaller...only in their fine dining establishments. In most other places in the USA, the problem is one of plenty! @Renny: Enjoy your trip; I am enjoying your posts and pictures from the Southern France very much. @mina: Welcome here! And I love your blog; looking forward to your posts as you tour the world! What a nice post yar.